Manhattan Fog. Penguin Art Print. 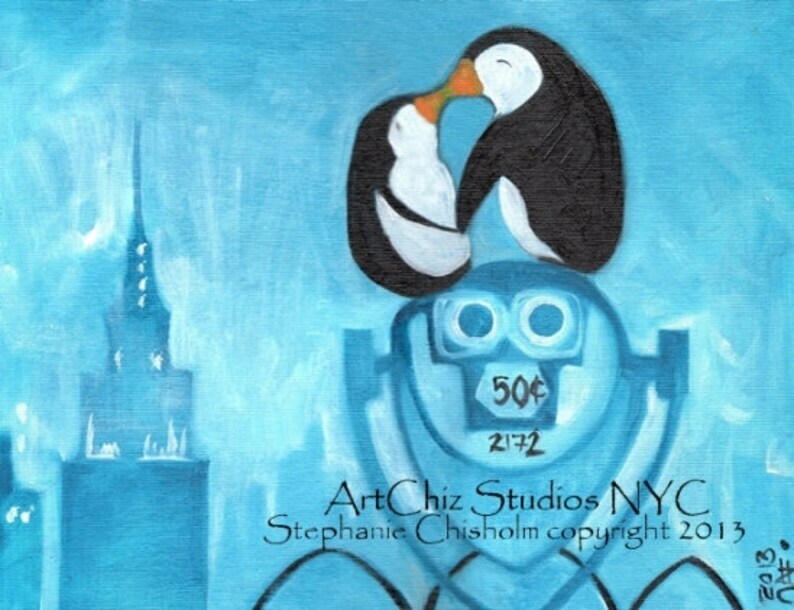 Two Penguins Kissing in NYC. Empire State Building. Anniversary Gift. Valentines Gift. Sapphire. Poster. Let's just stand here awhile and kiss. Signed fine art print by Stephanie Chisholm . MATTED Prints are Matted in Archival Museum Quality Snow White Mat - will fit in a standard frame. ArtCHiz Studios NYC | Animal Art Fun!!! Copyright © Stephanie Chisholm, all rights reserved. Empire Panda. Panda Art. Panda climbing the Empire State Building in NYC. Awesome children's illustration, kids art print, poster. Two Pandas Kissing Flying Over the Empire State Building. Red Heart Ballon. 4X6 Inch Original Canvas Painting. Love. New York City. 3 Penguins. Salmon. Penguin Art. Penguin Illustration. Children. Print. Poster. Kids Art. Signed by the Artist - 3 Sides of a Panda. Stephanie Chisholm's artwork is a joyful portrayal of her love for animals. This was the first item I purchased from her, and I've since bought two more. They're unique and expressive. Also, the items are packaged safely and were shipped quickly, and my communications with Steph have been delightful. Ordered two prints for my future niece or nephew's nursery. They came extremely fast and are absolutely ADORABLE!! Such vibrate colors and perfect for the nursery! They came matted and will look great framed. And came with the sweetest thank you note. Thank you for helping us start our Art Chiz collection! Very, very lovely fox pendant!! The fox has a very smart look! We do not currently accept any other payment method. Orders shipping to New York State Residents will be charge 8.875% Sales Tax. Any non-custom item may be returned within 10 days in its original condition and the full purchase price will be refunded. Shipping costs are not refundable unless I made a mistake. All returns must be requested by email PRIOR to sending the item back. Items returned must include a copy of the return request confirmation to assure a refund. Shipping is by US Postal Service. ~ Import duties and related fees and/or taxes are not included in the item price or shipping charges. These costs are the buyer's responsibility. ~ Please check with your country's customs office to determine what these additional costs will be prior to buying. You are responsible for knowing and accepting your country's regulations and all related fees on international purchases. ~ These charges are normally collected when the package is delivered to you. ~ I fill out Customs Forms with exact value and accurate descriptions as required by law. ~ Orders to USA addresses usually arrive within a week, but may take longer. ~ Orders to other countries usually arrive within 3 weeks, but may take 8 weeks or more. ~ For International Orders I cannot track your order once it leaves the United States of America. ~ I have no control over the time it takes a delivery service to deliver any order. I replace orders that have not arrived in 6 weeks domestic or 8 weeks International. Please notify me if your order does not arrive within 4 weeks (USA) or 6 weeks (international) so that I may begin to prepare a replacement. Just send me a message with what you want and I will provide a quantity requirement and price list. 3 Sides of a Panda. Panda Art. 4X6 Inch Original Canvas Painting. Sapphire Blue. Handmade Canvas painting for Baby. Baby Shower Gift.